The release of acid mine drainage (AMD) from mines and mine wastes is an environmental problem of international scale. The AMD results from the oxidation of sulfide minerals and the release of acidity at rates that exceed the capacity of carbonate and aluminosilicate gangue minerals to neutralize the pH. Static testing protocols used to assess the potential for AMD generation are based on chemical characteristics, and generally do not consider the mineralogy of the waste materials. Static testing of pure minerals and samples of typical host rocks indicate that aluminosilicate minerals are unlikely to provide neutralization at rates that are sufficient to prevent the release of AMD in wastes containing more than a very modest sulfide content. The products of sulfide oxidation include a broad range of (oxy)hydroxide, sulfate and hydroxysulfate minerals. The most common of these secondary minerals are goethite, gypsum and jarosite. 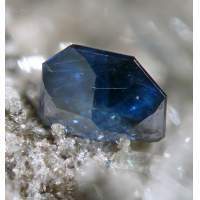 Covellite is common in wastes derived from copper deposits, and marcasite and elemental sulfur are common in waste deposits containing pyrrhotite. The mechanisms of abiotic and microbially mediated sulfide oxidation have been studied extensively. Microbially mediated oxidation of acid-soluble sulfide minerals is initiated by the release of H2S, and follows the polysulfide pathway, whereas the oxidation of acid-insoluble sulfide minerals is initiated by oxidation by Fe(III) and follows the thiosulfate pathway. The paragenetic sequence for the oxidation of sulfide-bearing mine wastes has been defined. This sequence includes more extensive accumulation of elemental sulfur associated with wastes containing acid-soluble sulfide minerals.A variety of active and passive approaches exists for the remediation of AMD-generating waste-disposal sites. Although many of these techniques have been implemented at mine sites, other novel approaches are currently being evaluated. Passive treatment systems are desirable because of the lower costs associated with these systems and the long duration of AMD generation.